The fruitweb scab model was developed as a decision support model for fruit growers. The software simulates the biological processes of ascospore maturation, ascospore discharge and the interaction of the scab fungi with the leaf. The various processes are graphically displayed and provide information on the course of infection and severity of infection. Critical to the scab management in fruit growing is that a sufficient fungicide coating is present during the germination period of the spores. The more severe the infection the better the coating has to be in order to prevent a scab infection. The fruitweb user will see the potential of mature ascospores in the model and use it as a decision aid prior to announced rainfall. By including a local weather forecast it´s possible to show the course of infection if an announced rainfall event occurs. Since the fruitweb continuously shows the course of infections, it´s possible to apply contact fungicides directly in the infection window with increased precision. The exact determination of the onset of infection, the use of effective curative fungicides can be better planned and scheduled. fruitweb Asco: unlike fruitweb Mills this model is a quantitative model. The model calculates the number of released ascospores at each rain event and calculates how many of these spores leads to an infection. fruitweb Mills: starting from an ascospore release the model calculates the infection curve according to Mills. In this calculation the actual number of released ascospores is not considered. In the default settings it is set that the fruitweb Asco model appears first. You can use the button "show fruitweb Mills" to switch to the Mills model. In the lower part of the graphical display, you will find light blue bars directly above the time axis. These indicate leaf wetness periods on the basis of weather data. The dark blue bars indicate the rainy periods. The actually incurred rainfall is displayed as small blue bars. Each bar represents the amount of rain in 30 minutes. The amount of as yet immature ascospores is indicated by the light green area. 100% of ascospores are immature at the beginning of the season. As spores mature and become released in the course of spring, the amount of immature spores decreases. In addition, immature spores on fallen leaves may be lost by substrate decomposition. Mature ascospores are indicated by the dark green colour directly above the light green area. Mature ascospores are ready for discharge during the next rain. A large amount of mature spores indicates that a serious scab infection is likely to occur during the next rainy period. The grey curves indicates the Mills infection curves in a range of 0 to 100 % for the first discharged spores of each ascospore release event. This shows whether the ejected ascospores have led to an infection or not. Discharged ascospores are displayed by yellow bars. Ascospores alighting on apple leaves will begin to germinate. During germination, spores are highly sensitive to contact fungicides. Fungicide treatments during this period are therefore very effective. The white area represents the amount of living ascospores on the leaf. There are two developements possible. The area increases, because of new ascospore discharges. The area decreases, because the ascopores die or an infection occurs. Therefor the white area represents the amount of ascospore that can be reached by a contact fungicide. The red line indicates an increasing number of spores at advanced stages of germination, ready to penetrate the leaf surface. These spores do not require free water (leaf wetness) for subsequent stages of their life-cycle. Further, they are no longer sensitive to contact fungicides. Curative fungicides are required in order to fight scab infections at this late stage. Discharged ascospores are displayed by yellow bars. At the fruitweb Mills model they have the function to set the beginn of the scab period. The number of released Ascospores have no impact on the calculation of the Mills infection curve. This is the task of the fruitweb Asco model. The Mills infection curve is displayed in grey in the range of 0 to 100 %. The curves start with 0 % when the first ascospores are discharged. The infection curve shows whether the ascospores have led to an infection or not. For the calculation of the infection curve we use the revised Mills table. Above 100 % the Mills infection curve is displayed in red. The height of the infection curve indicates the severity of a scab infection. ATTENTION: this curve does´t consider the number of ascospores. This is the task of the fruitweb Asco model. The dashed lines indicate the severity of the infection according to Mills. The division is made in light, medium and heavy. With the button "Show fruitweb Asco" you can switch to the Asco model. The fruitweb Asco Model has to be initialized by a starting point. This is done by the so-called Biofix. The Biofix describes the date on which the first ascospores can be ejected. This can be done by examining the pseudothecia under the microscope or by the shake out method of Kollar. Alternatively, the Biofix can be determined by the stage of green tip of an early apple variety (Boskoop, Jonagold, Delbarestivalle, Holsteiner Cox). For the major fruit growing regions the Biofix will be set by us. If you are outside these areas, then please send us the Biofix for your location. By setting "Biofix individual setting" you can overwrite the general Biofix setting. 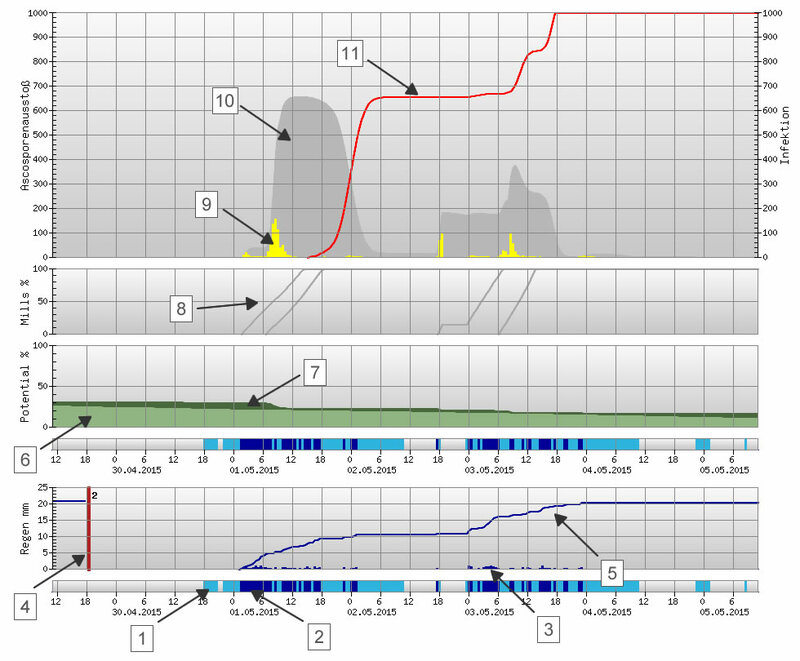 In the fruitweb Asco scabmodel it is possible to show the fungizide sprayings in the graph. Below the graph you can find the tab "Edit Sprayings". There you can set up various field to establish spraying programs. Beside date, time and fungizide you have to set the duration of the fungizide cover. If you have set up several fields you can choose the field you want to display here. There are three possible ways to show the decrease of the fungizide cover. Efficiency 100%: the fungizide cover has an efficiency of 100% during the whole length of coverage. This is not a realistic way of presentation but it makes it easier to estimate the amount of ascospores that come to an infection after the fungizide cover ends. Efficiency 75%: in this presentation we start with an efficiency of 98% . The efficiency decreases during the length of coverage linear to 75% . Washing away by rain and the increase of leaf area stay unconsidered. Calculated Degragation: in this presentation we do not consider the set length of coverage. Instead we calculate the degragation of the fungizide efficiency by considering the rain and the increase of leaf area. The end of the fungizide cover is reached when the calculated efficiency is 75%. This value can be changed in the scab settings (Edit scab settings > Sprayings). With this button you can show / hide the sprayings in the graph. The basis for the simulation of apple scab is the recording and transmitting of weather data through a weather station. The fruitweb GmbH offers various weather station types to suit different situations and needs. Some of the stations may also be used for a reliable frost warning. An overview about the different weather stations you can find here. Here you can test the full functionality of our fruitweb model.